Arrow doesn’t do this sort of episode too often, but my goodness was tonight’s story the archetypal example of a table-setting episode. 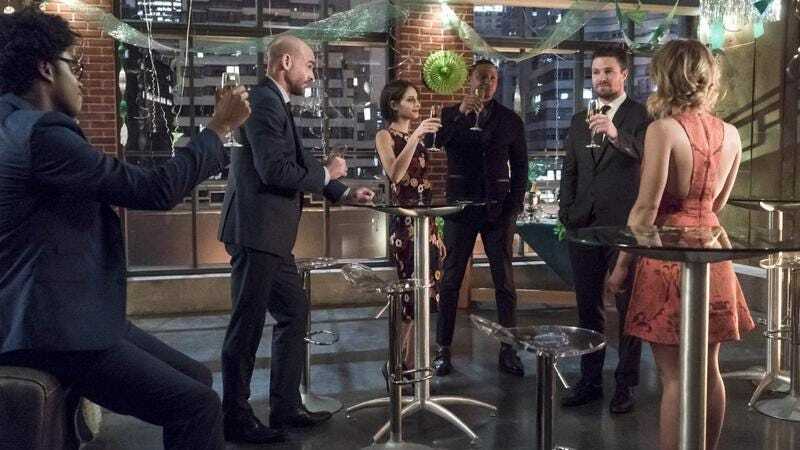 Sure, stuff happens, with the entirety of Team Arrow captured and Oliver assembling one hell of a trio to take on Prometheus and his allies, but almost everything tonight is about setting up next week’s season finale. That’s understandable, as next week appears set to function as a conclusion not just to this season but to the first major phase of the show’s existence. After all, we run out of flashbacks as of next week, with Oliver having to defeat the resurrected Konstantin Kovar so he can be rescued by the fishing boat and complete the circuit with the series premiere. Whatever happens in season six and beyond, Arrow is leaving a big part of itself behind at the end of this run. Even allowing for how good the flashbacks have been this season, that’s probably a good thing, considering how gratuitous they felt in the third and fourth seasons, which is a lot of cumulative wasted narrative real estate. But that’s a big deal, and it only makes sense to bring everyone back to Lian Yu for what could conceivably be the final time. While Team Arrow figures to play some role in the finale—it would be a pretty big waste to build up the team over the course of the season and have them be bit players in the endgame—the true point of “Missing” is to bring together four of the most formidable fighters in Arrow history to take on Prometheus and his pals. John Barrowman returns from his excursion on Legends Of Tomorrow for his first proper appearance since the early going of the season (not counting his quick flashback cameo in “Kapiushon”), with Malcolm Merlyn once again invoking his all-purpose right to look after Thea. Arrow has found something really fun in Oliver and Malcolm’s relationship, which transcends such straightforward terms as “friends” or “enemies.” Both have done horrendous things to the other, yet Malcolm understands a portion of Oliver that no one else—not even Adrian Chase, for all his psychotic claims that he and Oliver are alike—can properly understand. As Malcolm observes in one of the season’s best lines, it’s sad that a sociopath like him has to explain to Oliver the value of human relationships, but here we are. There’s a general sense that Arrow is trying to pull together strands from all its previous seasons for the big finale. Malcolm Merlyn has been around throughout the show’s run, but his specific references to the Undertaking and Oliver’s days as the Hood remind that he was the primary villain of the first season. Yao Fei is an even more crucial reminder of the show’s origins, reminding us that it was his presence and his sacrifice—in some ways a more important one than even that of Oliver’s father—that set our hero on his current path. We get one hell of a connection to the show’s second season, but we’ll get back to that, because, well, damn. Elsewhere, Nyssa’s return provides a callback to season three and Ra’s Al Ghul, especially when she will inevitably face off against her sister Talia in the finale. There’s not necessarily as obvious a link to the fourth season—feel free to point out one I’m missing—though I suppose Oliver and Felicity potentially rekindling their romance might count. Either way, the show is bringing everything home for next week’s finale. I go back and forth on how much actually happens in “Missing.” There are important character beats here, as Oliver gets well-observed moments with Thea and with Felicity. Oliver explaining his decision to send Felicity and Diggle away is again an illustration of how Arrow has learned to have Oliver isolate himself for not entirely self-destructive or sulky reasons, which is nice. Yet this episode struggles with much the same issue I discussed in last week’s review, which is the show has committed so much to the notion that Prometheus is invincible, which robs a lot of dramatic tension from the proceedings: Of course John and Felicity are going to get captured in short order by Chase’s associates. The episode acknowledges that Team Arrow should never have believed Prometheus was done after his capture, with Oliver even claiming he suspected it was a ruse all along—which, okay, sure, but that didn’t exactly come across last week. Anyway, the die has well and truly been cast at this point, so I will spare you my carping. 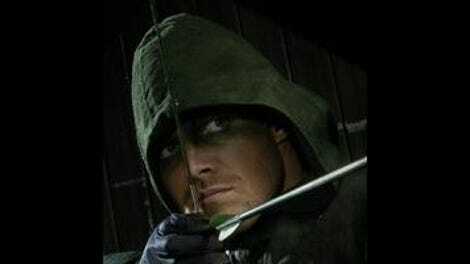 Suffice it to say we’ve yet to see any evidence Oliver or Team Arrow can truly counter Chase, who as Malcolm says is always about 50 moves ahead. Oliver is going to need one hell of an equalizer. Why hello, Slade Wilson. In what has to be the single most exciting return the show could pull—well, fine, there’s a couple other possibilities I’ll mention in the strays—Manu Bennett makes his long-awaited return as the still-imprisoned Deathstroke. There’s no real way to know where Wilson’s head is at after all this time, or whether he can be trusted, though it’s probably a good bet to say, nah, he totally can’t. But in putting together a team fearsome enough to stand a chance against Chase, Talia, and their associates, it’s hard to imagine a better combo than Malcolm, Nyssa, and Wilson. And Slade is essential because he’s really the only character left who properly spans both the past and present sections of Oliver’s story. If by some miracle Oliver and Wilson can come out of this alive and reconciled, then that would arguably be the most powerful way for the show to complete Oliver’s redemption from the trauma and the violence of his five lost years. But never mind that: Manu Bennett is here, everyone, and that alone is cause to celebrate. And that speaks to why I don’t really have a problem with “Missing,” even if it feels slighter in construction than most of Arrow’s penultimate entries. This season has been stronger thematically and narratively than the last couple, but along with that it’s just been fun in a way the show has struggled to be in recent years, Neal McDonough scenery-chewing and John Constantine guest spots aside. And “Missing” finds ways to be fun even as it makes the final set of moves for the big, scary showdown, with Malcolm in particular serving as the darkest possible comic relief. This episode plays like Arrow on the cusp of graduation, with everyone showing up for one last hurrah before the show becomes something else. This week is just the serviceable setup for what will hopefully be next week’s grand finale. When Oliver was warning Malcolm to be professional around the help he had enlisted, I really thought for a second Roy Harper might be about to show up. I mean… he did date Thea, right? That might be a thing Malcolm wouldn’t like! But nah, Nyssa was the better choice here. Nowhere to do parkour on Lian Yu, for a start. Okay, so I think there might be one return that would be even bigger than Manu Bennett as Deathstroke, but it’s damn close. It’s the woman he killed in front of her children: If Moira Queen somehow showed up back from the dead, that might blow the roof off the show. And yeah, probably not in a good way. Everything with Lance, the Laurel of Earth-2, and Thea was perfectly handled. Paul Blackthorne and Willa Holland are as reliably great as ever, and Katie Cassidy did nice work as the evil, sadistic Black Siren. As is tradition, this is the annual episode named after a Bruce Springsteen song. “Missing” is okay, as these things go, but maybe a little on the nose. I don’t think any pick is ever topping the first season just straight-up calling its penultimate episode “Darkness On The Edge Of Town,” honestly.